Sometimes figuring out what key to tune your lever harp in can be confusing. Unlike concert harps which are fully chromatic, lever harps cannot play in every key. Lever harp players therefore have to find different ways of accessing the largest number of possible keys. The most common way of doing this is to tune the harp to E flat (Eb). For a more detailed insight into why lever harps use this system and more importantly, how to do it, you can watch Allan take you through the process using the video on the right – or you can follow the instructions below which include a handy chart. If you’re not sure how to tune a harp by ear or with a digital tuning meter you can follow our guide here. Many newcomers to the harp will tune their harp to C major, which is the same as having all the white notes on the piano (when all the levers are off). Whilst this does simplify the learning process initially, it is also more limiting and can waste the potential of the harp semitones by limiting the number of common (and thus useful) keys available. Tuning in C major only allows you to add sharps and therefore (for example) means that the harp can never be set to any key including flats, such as F major (a very common key). Tuning in Eb major, on the other hand, allows the harpist to play in a wider variety of keys. Whilst if you are new to music this requires slightly more brainwork initially, the flexibility of tuning in Eb major will pay dividends as you become more familiar with the instrument. So what strings do I tune differently? As you can see from the diagram opposite, there are three notes which are different in the key of Eb – Eb, Ab and Bb. 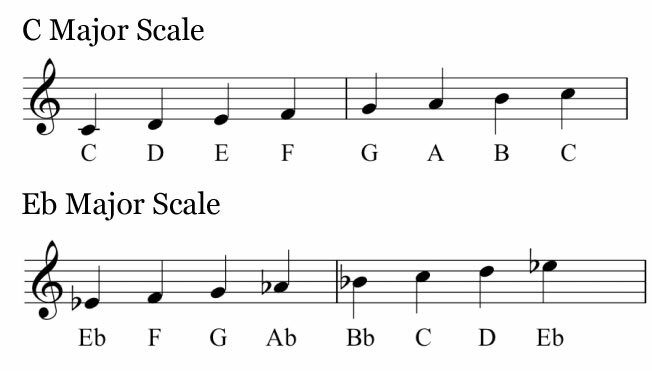 If you are tuned to C major, you simply need to tune E, A and B down a semitone (for our handy tuning guide click here). Regardless of whether you are tuned in C or are already in Eb, make sure you have all your semitones in the down position whilst tuning! You can use the table below to find out which levers need changing to access the various keys available in Eb. We also have a handy downloadable PDF guide to semitone lever positions which you can download free here.